Education is another of the primary social institutions from which we learn the values, attitudes, beliefs, and behaviors of a dominator culture. A discussion of education as a social institution embraces: (1) how we come to know (epistemologies); (2) the methods of teaching and learning (pedagogies); and (3) what we know, the content of our knowledge tradition. In Chapter III, I explored some ideas about epistemological barriers to women in IT education related to our philosophy of science. For example, some scholars have argued that since more women tend to be concrete learners, and more men tend to be abstract learners, women may be less comfortable with the abstract approaches that predominate in science and IT education (Belenky, 1986; Estrin, 1996; Goldberger, 1996; Greenbaum, 1990; Keller, 1992; Kramer & Lehman, 1990; Riger, 1992; Rosser, 1995; Turkle & Papert, 1990). In Chapter IX, I will address questions of epistemology and pedagogy in more depth as I propose a partnership model of education. In this chapter, I would like to focus on the third issue, that is, the content of our knowledge tradition. This chapter explores: (1) our incomplete knowledge tradition; (2) a brief her-story of women in math, engineering, and IT; and (3) the ins and outs of women’s education and employment in these fields. How our knowledge tradition has been influenced and limited by those who were able to participate in its creation. That there have been educated women who generated ideas and inventions for centuries in spite of their exclusion from systems of formal education. A brief her-story of some of the women who have contributed to scientific and technical knowledge creation in spite of the many barriers they faced. How the historical legacy of women’s intermittent access to and exclusion from scientific and technical education (and the professions) influences women’s participation in science and technology today. The Western knowledge tradition reflects the dominator social system from which it has emerged. Education as a social institution purveys the message that only certain people have accomplished anything and only certain perspectives are “worth” learning about. The disciplines and their “ways of knowing” were created by a group of people whose circumstances and experiences of their world were not reflective of the broader population. Therefore, the questions considered relevant for study, the proposed methods of study, and the content of today’s academic disciplines are the result of a narrowly informed set of perspectives. 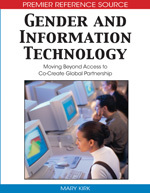 “Other groups, with a different set of experiences—in this case, women—were largely excluded from the identification of problems and the creation of disciplinary knowledge and tools of analysis” (Bucciarelli, 2004, p. 138). The histories that we record, the literatures that we consider classics, the disciplines that we consider important, the ways in which we come to know, and the ways in which we teach and learn originate from giving primacy to a singular set of perspectives for centuries. This has led to the development of an incomplete, and perhaps even distorted, knowledge tradition.